It's time we start doing our homework on this guy because he'll be in play for our pick whether people like it or not. A lot of posters scoffed at the suggestion of McGlinchey last year, and Jonah shares a lot of the attributes that made McGlinchey appealing to the team--football junkie, pro-ready, athletic, quick feet, good strength and power, lunch pail guy, tough, outstanding run blocker, solid in pass pro, etc. Williams has been praised for his "tireless work habits" since he was a 5-star recruit at Folsom HS, where he protected Jake Browning's blind side. 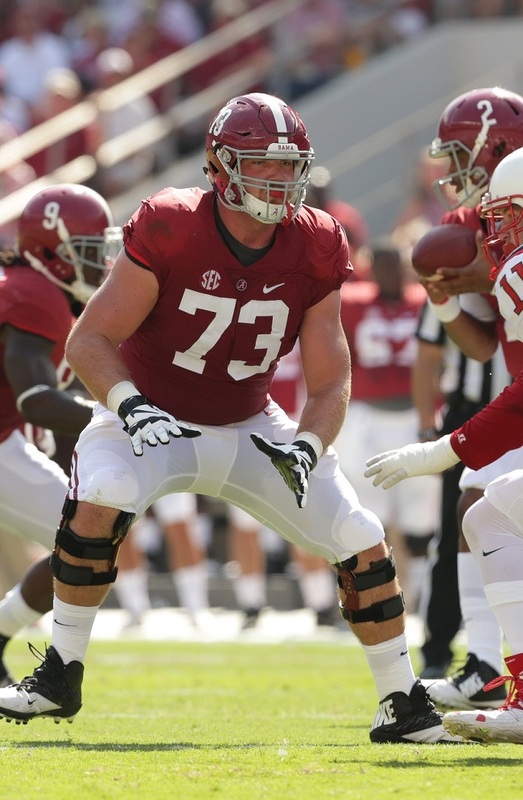 Teammates and coaches in Tuscaloosa describe him as a "film junkie" and "football addict." He keeps a notebook where he writes down what he wants to improve on every day, and he spent the summer of 2018 working out at an official-sounding place called Boost Sports Performance to work on his game. Definitely going top 7, he's easily the best T in this class, don't think the niners take him with Staley still looking strong..G is the only need IMO on the line..
Yeah McGlinchey made sense in hindsight after we moved Brown. Staley while old still has a few years left IMO and clearly a fit for the team and a team leader. As bad as we've been can't see us taking essentially a backup OT top 5 when we're rebuilding. I wouldn't be mad IF we addressed Corner and EDGE in Free Agency. I just don't see us going back to back tackles unless Staley retires. It's been mentioned that he can start off at OG then eventually move to OT. His skill set seems perfect for KS. As a prospect he's not bad and certainly fits but I'd be bummed if we didn't grab a top tier edge guy in this class. Very few top edge guys are taken outside of the first round. And they certainly cost a pretty penny in free agency and none of the great ones hit the open market unless they're nut cases. Out of the top 10 sack leaders right now only 3 aren't first round picks. Biggest one there is Danielle Hunter who is the sack leader right now but that guy was all raw talent with only 4.5 sacks at LSU and still went in the 3rd round. Frank Clark dropped cuz of the off the field stuff. Mario Addison is the only wtf on that top 10 list. Really hoping we find our next stud rusher in this draft so we can have him for a long time. The exact same thing could be said about Left Tackles, Staley's knee is clearly an issue and he isn't getting any younger. I would just go on who the better prospect is. Another thing to think about...I dont care who's rushing the passer - In today's NFL with the current rules, you're not going to shut down the Rams, Chiefs, Saints, Patriots anyways. This guy is really good but for us he wouldn't make sense unless all the edge rushers, DB's and receivers are gone when we pick. (highly unlikely) With only 5 picks unless we pick up some via trade we have to be really selective. We can't afford to miss on more than one guy. Free agency can help fill in but I don't know who is going to be available this off season. This is supposed to be one of the stronger defensive drafts in a long time so the few offensive players that are highly rated will go quickly for the teams seeking offensive help. Hopefully this means we can still get a quality player in round 2. Wish we had more ammo to move up. Since this team lacks talent across the board, you take the best player available when you pick. If he is the best when we pick, I would have no problem with the choice. Plus, the kid has Norcal roots. If everybody is clamoring for the edge rusher, throw a boat load of money at dee ford and some mid-tier guy and hope for continued growth. Must be solid on the lines--O and D, Williams makes the team better! What's currently worst, our LT or pass rushing? That's so short sighted, what would be worse if Staley retired? You move McGlinchey to LT and Coleman plays RT. Not ideal but it's likely better than Cassius Marsh starting another season. I used the word "currently" and not the future.